Seattle in the haze from wildfires in British Columbia to the north and the Cascades/Glacier National Park to the West, September 5, 2017. 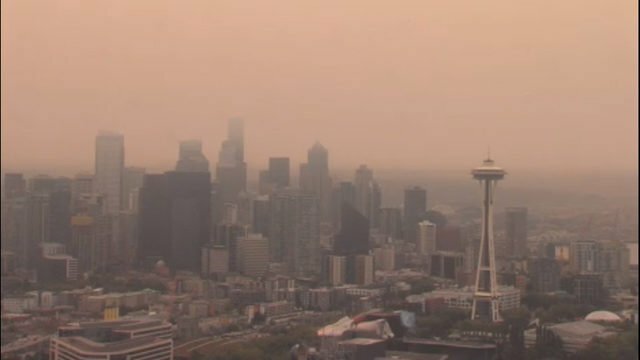 The haze lasted three weeks and Washington State was under a do-not-go-outside advisory for the second time that summer. I have started to assume there’s no hope. It started when half my country burning while half my country flooding crashed me into a depression deeper than I’ve ever known. My parents couldn’t go to Glacier National Park after visiting me in Seattle. My in-laws had to evacuate for Hurricane Irma. The EPA’s website no longer has information about climate change. When my generation retires and has time to see the world, there will not be much left. Climate change is the ultimate housing crisis. Then, out of my despair, I signed up for a climate workshop. I joined environmental-action groups. My hope had protected me from searing anguish, yes, but also blunted my sense of urgency, not just about the grave injuries our planet is struggling to sustain, but also about the dreams for my own life. Hope deferred makes the heart sick, Proverbs 13:12 begins. Hope also deferred me. But Someday is now ash on wind. There are reasons besides hope that people who know the world is going to hell still do good: the greatest of these is love.